Super aromatic and healthy salad with lots of roasted veggies, fruit and feta. 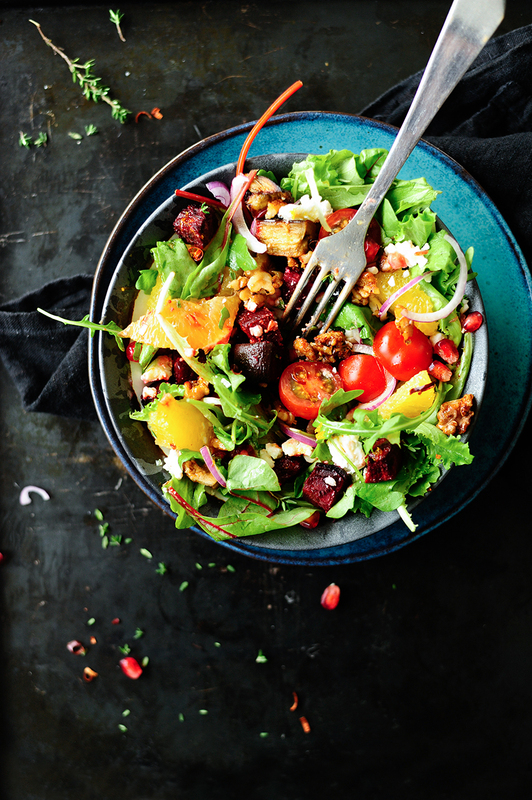 The base of this salad is made up with roasted winter beets, eggplant and caramelized spicy walnuts. It’s a rich salad that gets dressed up in a delicious citrusy dressing. This is also the perfect salad to pack for lunch or for a dinner party as a side dish. I’ve found out that the longer the salad marinates in the dressing, the better it becomes. This salad is delicious and pretty simple to throw together. This is my kind of food, i love it! Spread the beetroots and eggplant on a baking sheet, combine with olive oil, orange juice, thyme, smoked pepper, cumin, ginger and cilantro. Season with salt and pepper, roast for 20-25 minutes at 180°C. Toss the nuts together with honey and cayenne pepper, spread on a baking sheet and roast for 10-15 minutes. Combine the ingredients for the citrus dressing in a bowl. 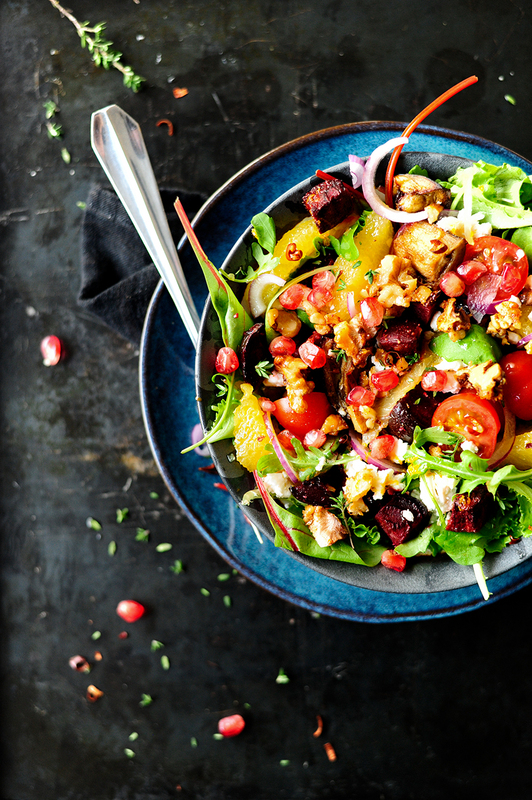 Add the salad to a large bowl, add pomegranate arils, sliced orange, feta, cherry tomatoes and red onion, toss and add roasted vegetables. 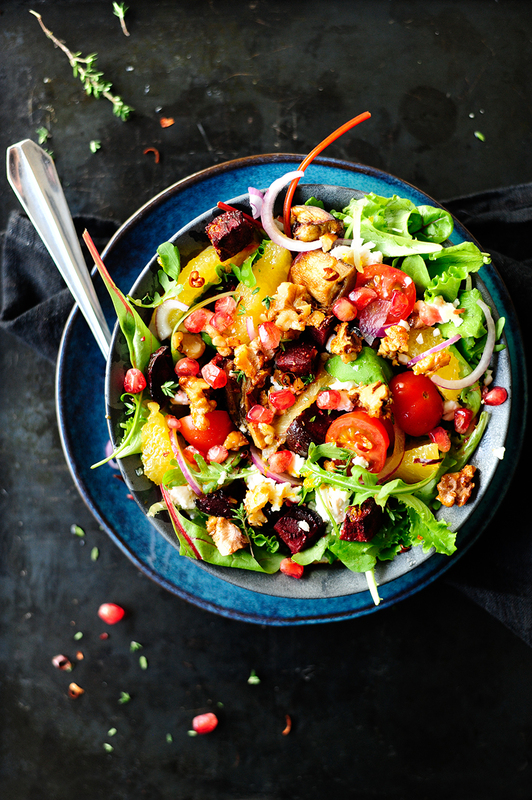 Drizzle the citrus dressing, sprinkle with caramelized nuts and dried chilli pepper flakes. Enjoy!